Nicole's Needlework: Back from Amy's! Of course I couldn't leave without the new (re-released) pattern from Samplers Remembered "Mary Allen 1818," and a couple other little goodies from Kelmscott. I fell in love with this pattern after seeing Siobhan's sampler. It's so pretty!! As promised here is my progress on SoHRH (Shores of Hawk Run Hollow). It's not a lot of progress - I hope to stitch more on it this weekend. And here's my little progress on Paradise Lost. I finished the fill in on the banner. Well, I just ordered pizza for everyone, although I'm still stuffed from lunch. I'm sure I'll find a way to eat a slice though! Write soon! Love watching all your stitching progress, Nicole. The stash enhancement is lovely too. Aren't those scissors cute? Sounds like a good time was had at Amy's! Glad you had a great time with Amy! Too bad about your son's game. Love your stash! And your WIPs too! More great stash Nicole! I love those scissors you picked up. May just have to get me some of those! Glad that you had a great day today. And your progress on both your pieces is looking great. Great progress on PL and good start on Shores. I really enjoyed stitching MA and it hangs over my fireplace. You'll love working on it and I'll enjoy watching your progress! 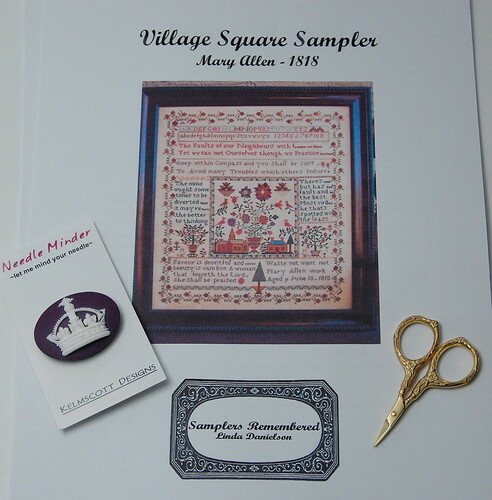 That sampler was one of my favourite releases from the market (that and the new Jenny Bean sampler). All your progress looks lovely! Sounds like a fun time today! Aren't you glad that they re-released Mary Allen?!! I added it to my have-to-have list from market! Sounds like you had fun today and made Amy's birthday extra special!! 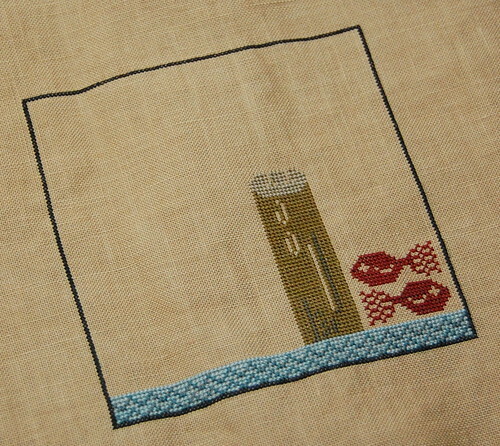 Love the progress you are making on the samplers - not much further to go on Paradise Lost! Glad you had a good day at Amy's. Love your new stash and your progress on your WIPs. It sounds like a great time, Nicole! I love your stash enhancement. :) Love the stitching progress! Sounds like you had a fun time. :) I saw the cake on Amy's blog. Very pretty! Nice stash-that Mary Allen sampler is so pretty and love the Kelmscott goodies too. Nice progress on Shores and PL. Glad you enjoyed your time with Amy. Did you know that birthday cake is really an anytime I need a piece of cake cake? A friend told me that once. We would have a small b-day cake whenever the notion would strike - one piece for her, one for me and the rest for the families (or whoever got home first). What fun times we had over cake!